(1998) I can’t remember the first midwife’s name. Might have been Andrea. The Midwife Collective model meant that I had a main midwife and then a back-up midwife – I would see one person consistently and then at some point further in the pregnancy get acquainted with another. Of course midwives have more than one client at a time and are always on call; this system was to help ensure the baby would be delivered by someone familiar to the mother. My last appointment with the Collective (although I didn’t know it was to be my last) was with Sarilyn. She was filling in for someone else, who I think was to be my secondary midwife. So the back-fill was replacing the back-up. Sarilyn was old-school – a funky grandma who had been delivering babies for a while. Kind and thorough, if a bit disorganized. I was expecting the usual stuff – urine sample, weigh and measure, chit chat. 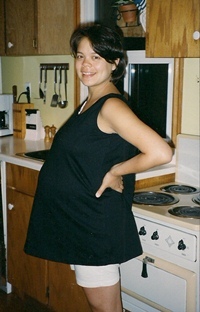 I was 28 weeks pregnant and had been following along with the What to Expect When You’re Expecting Book like I was reading daily Bible quotes (not that I ever did read daily Bible quotes – more that I was religious in looking up where I was at in any given week). I also knew that this time of the pregnancy, 28 weeks, was a bit of a dead zone in the check-ups. Hold the course, keep steady with activities, yes you can eat what you want…. No preparations yet, no birth ritual discussions. I felt I knew what was what and was expecting, well, nothing. In the back of my mind I wondered about some tension throughout my abdomen I’d been feeling. 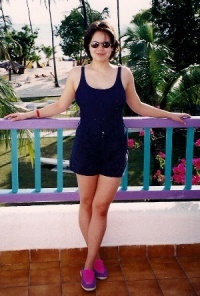 My belly had become barrel-like – not a low-down rounded bump most women have at this point, but a high-up thickness that didn’t vary from top to bottom. My whole torso felt very tight and sore. My skin was stretching uncomfortably and I found it difficult to breathe, especially when sitting down. My symptoms didn’t seem unusual – any number of indignities can be experienced at this stage and it’s not unreasonable to think I was just getting a bum deal. I mentioned to Sarilyn that everything was more or less fine – I was getting sleep, eating okay, feeling energetic – just one little thing was bugging me and it was that I felt really pregnant. We laughed and moved on to the physical exam. Part of the pregnancy assessment is to measure the belly. To compare against average growth (number of inches roughly equals number of weeks gestation), and to compare against the previous month’s measurement. Given both of these sets of numbers, at 28 weeks I should have measured 28-30 inches. 44 inches. Sarilyn put down the measuring tape and said the number out loud. We looked at each other. Twins or diabetes. These were the ‘good’ options – one was good because it was a normal anomaly, and the other because it was a known and treatable condition. There were other reasons you might be so large, Sarilyn said, but let’s not talk about those unless we have to. I could hear the uncertainty in her voice – part fear, part lack of medical experience with such things. I understood that if it was not twins or diabetes, things might be very, very bad. My decision all along had been to not ‘medicalize’ my pregnancy. I had opted out of any prenatal testing and ultrasounds – there was no history of physical or development issues in my family and I was (if I do say so myself) particularly healthy. So no intrusion or sneak-peeks. This optimistic rule was about to be challenged. Sarilyn suggested firmly an ultrasound was in order to clear up the mystery. I obliged with little fuss – I had taken the right stance and now that stance must fall because that is what must be done. With a flourish, I opened my appointment book (I had a Big Job – I was Project Manager in the New Media Department at a small but respected design firm) to see when we might explore dates for the following week. Let’s see – meetings Monday, maybe can squeeze in Tuesday, Wednesday is free, Thursday I’m…. My thoughts were interrupted. This is wonderful — I’m ready for more. I’m inspired by your “write on Mondays” idea — setting aside a particular day or hour is probably what I should do, rather than squeezing it in here and there. keep going… you left me hangén!! sounds wonderful so far. @Elizabeth – it was the only way I could make my writing a priority… otherwise, one more thing in a day I didn’t get to do. You are spot on with the narrative, in your usual personal approach…you left me wanting to turn the page and read on…is it Monday yet?? I can’t wait to read the next installment. I was skimming through blogs that I follow and I saw ‘a visit to the midwife’ and went what? Jennifer went to the midwife? The midwife? I thought maybe I was terribly out of the loop. I like hearing about people before they have their kids. I hope this is the beginning of your book. I’m so glad you’re writing and I love hearing your story. The building of story elements as well as dialogue is timed perfectly in this piece. Sometimes real life can just fall into place though, right? Without the need for fabrication or embellishment. Do you have a title yet or do you leave that to the end? Nice to see you writing again. I was also with the midwives collective and I can vividly picture than moment when things went awry. It does explain (to me anyway) why they have a good relationship with the SPP where I ended up.